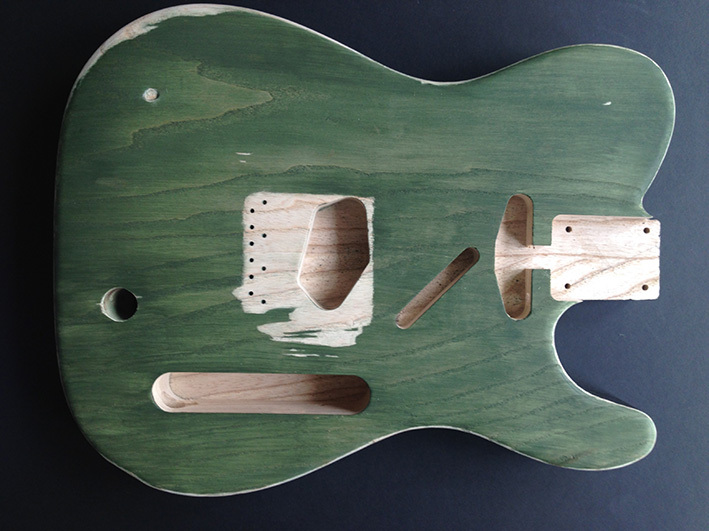 Today the body has had a few coats of special green paint applied to the front and a couple of coats of black to the sides, check out the pics below. These initial applications are all that is necessary for the right look. 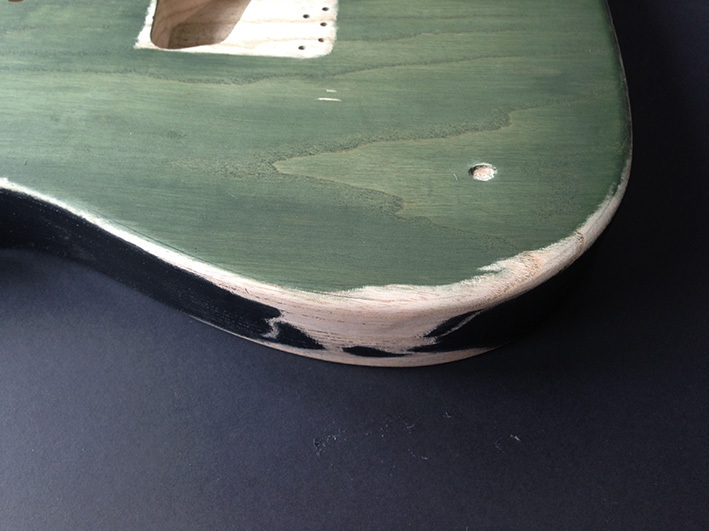 It’s important not to add too much green paint as the colour we now have will alter slightly during the ageing and relic’ing process. So, there won’t be any further coats of either colour paint to these areas. There will be a small area of black paint to replicate on the rear of the body, but this is very small and can be done at a later stage in the build. 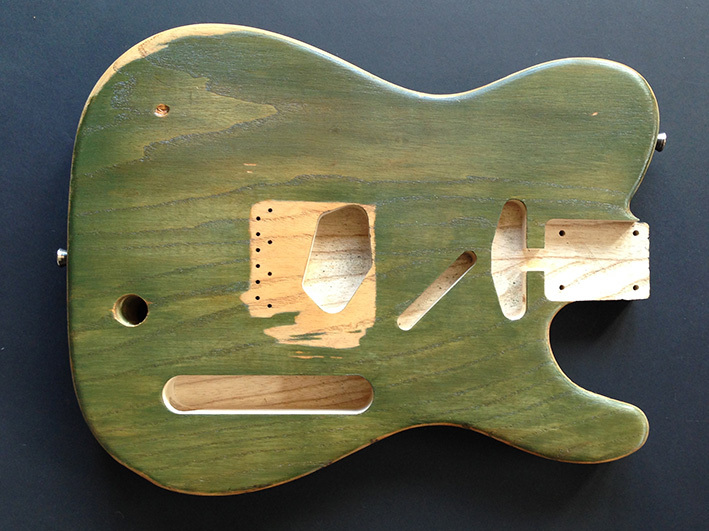 It will take some time for the paint to fully dry and harden and the waiting time for this varies from body to body. When the paint is fully dry though, the entire body will be aged and relic’d. So, all of the various patches of wear and tear present on the OG in 1985–86 will be faithfully replicated and the paintwork will be aged and worn to look like it was applied 15 years previously. 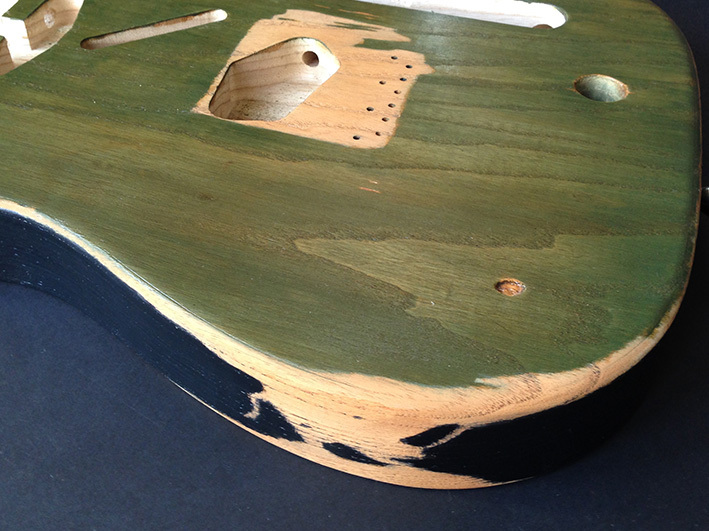 The relic’ing process will reveal lots of areas of bare wood and let’s not forget that the entire back of this guitar body is bare wood too. So, all such areas will have to be aged in accordance with the time period. This is a separate process from the general paint ageing and the general wear and tear relic’ing. When the ageing process is finished, the bare wood areas will remain just that… aged bare wood. 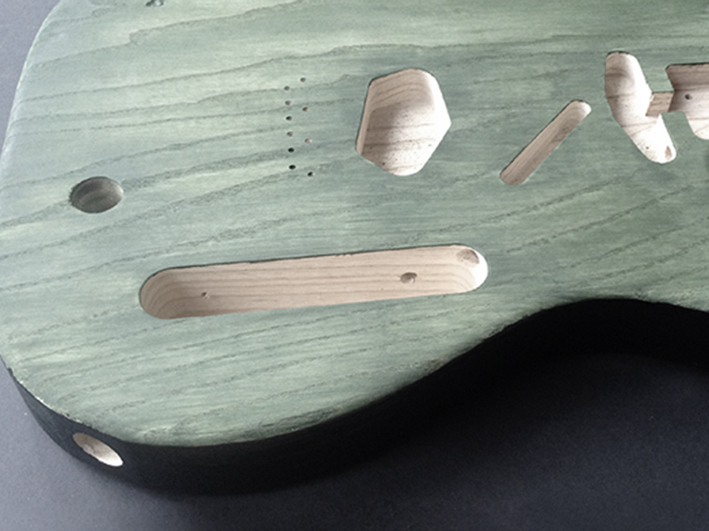 We’ve now done some initial relic’ing to the body. The patterns of wear on the OG in the mid to late 1980s are quite complex, especially the main area of wear created by Francis’ forearm and wrist. If we were building the 2014 version of the OG it would be quite easy to replicate the various wear patterns, as they are much simpler these days. as lots more paint has worn away. However, in our time period they were more complex and references are pretty hard to find, but they do exist… if you know where to look. You’ll see from looking at the first of the above two pics that all of the main wear patterns have been set out. This has been achieved by taking very detailed measurements from close-up shots and various video stills taken at the time. It’s worth noting here that the general wear and tear on this guitar body (and the neck of course) is the most important thing to replicate. I have seen a huge quantity of Francis Rossi replica Telecasters and the common factor with most of them seems to be that they have an approximation of the wear marks. Of all the replicas I’ve seen, there are maybe one or two which come reasonably close to reproducing the wear, but I’ve still yet to see one which is exactly right. So, to the best of my knowledge, and after a great deal of research on the subject, I can say that I believe we are creating the most authentic version of wear marks for the Live Aid period on this build. At last, following a few weeks of various relic’ing and ageing treatments, the body is now ready and I can finally post some pics. We’re not quite in a position where we can add any hardware or electrics yet, but we have been able to fit the two strap studs to the body. As you can see from the two pics above and the two below, the whole body has been relic’d and aged in accordance with all of the wear marks present at the time of Live Aid. 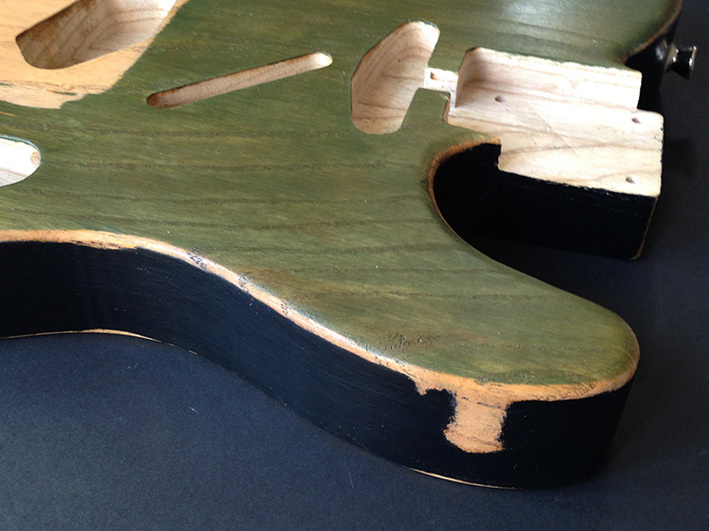 All areas of wear have remained as bare wood, but have been made to look much older than the new wood (which can still be seen in the main pickup and control cavities). 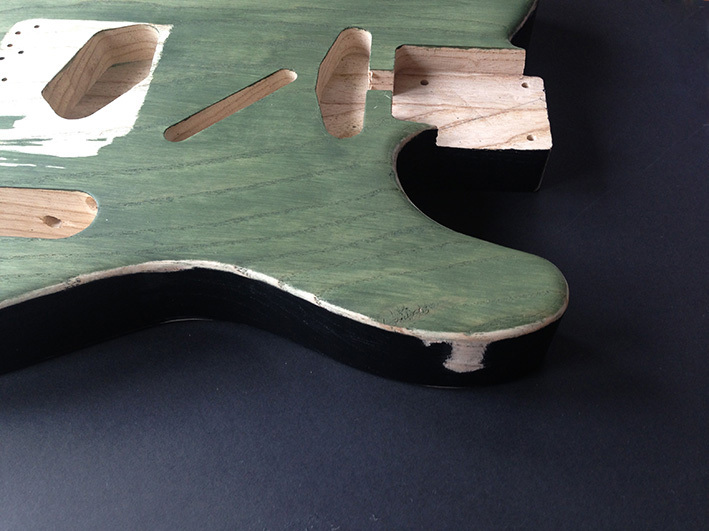 The bare wood areas have been left as ‘unfinished’ because that’s the way the OG is… the green paint has simply worn away over time leaving behind bare wood. Just as Francis’ guitar has continued to lose green paint and has slowly revealed more bare wood since Live Aid, so will this guitar. Whoever ends up owning and playing it will gradually add their own character to it over the years, as their playing will continue the wear and tear process in an authentic way. 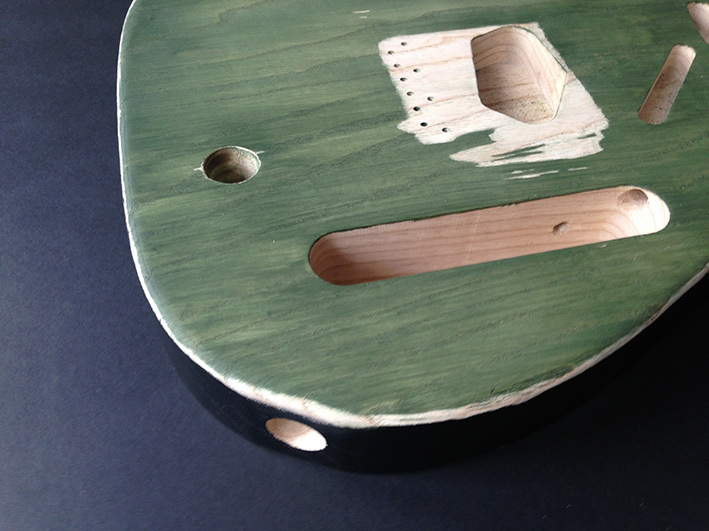 The wood will get dirty and shiny (just like the OG) and the green paint will continue to wear away. 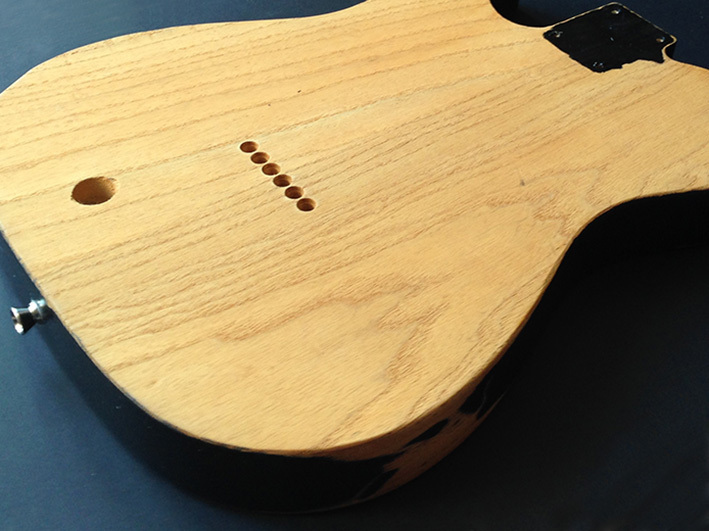 Below are a couple of pics of the back of the guitar body in a ‘bare wood’ state. The only paint added to this surface is the black patch you can see on the reverse side of the neck pocket. 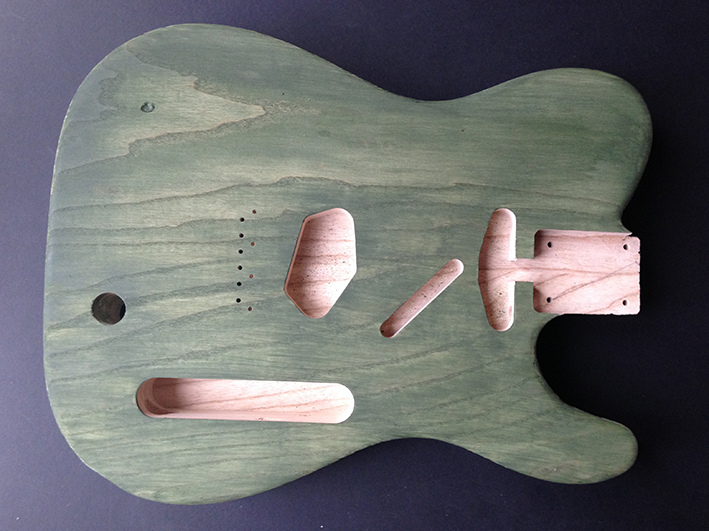 This patch will be covered almost entirely by the neck plate later on in the build. However, there are a few areas of black which poke out from under the neck plate (as on the OG). 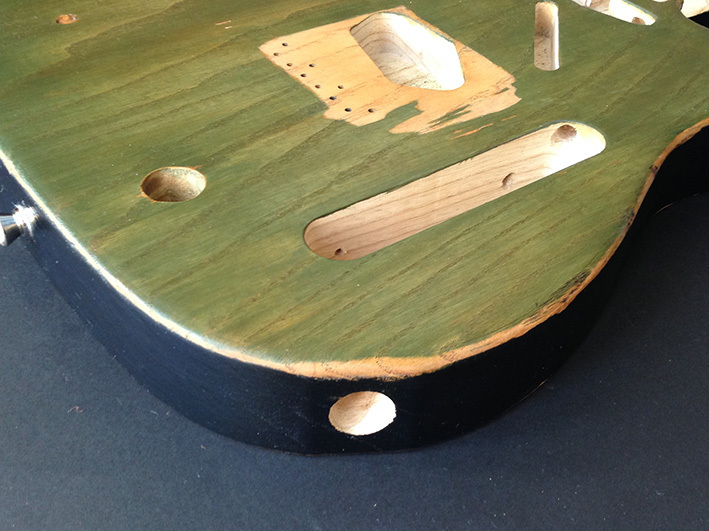 It is my belief that the guitar was taken apart (neck and body separated) for the black paint to be applied, which would explain why it pokes out from under the neck plate to this day. 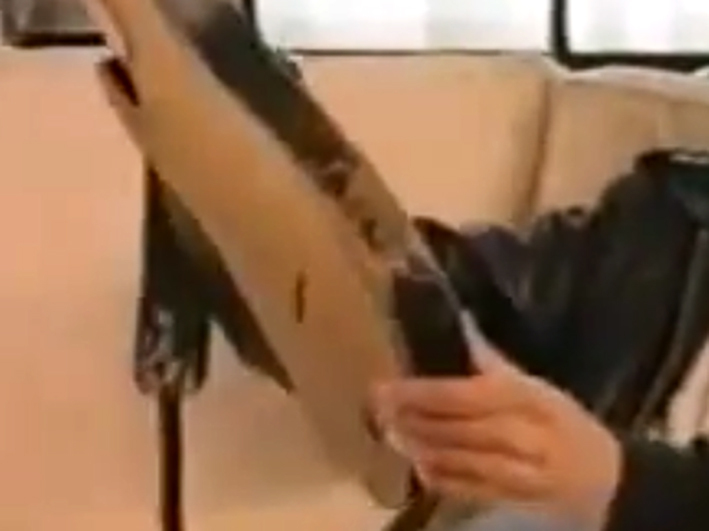 But, maybe the guitar wasn’t taken apart at all and the black was simply painted around the plate…who knows? 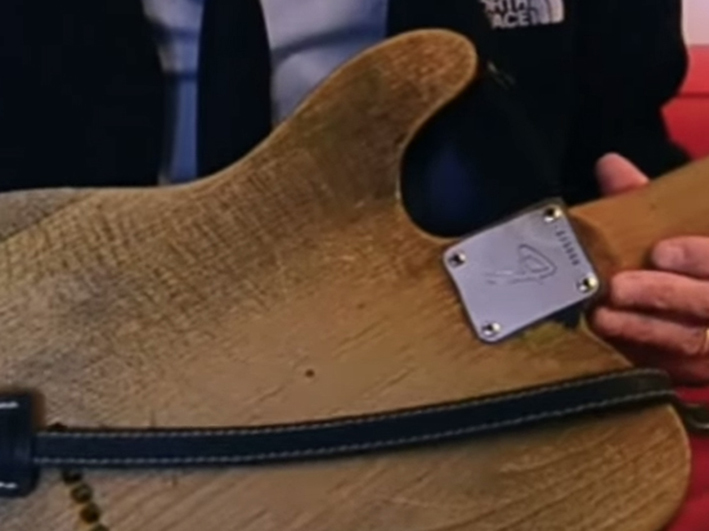 However, I think that when the black paint was sanded off, the guitar was not taken apart and so Francis sanded down the black paint as best he could with the neck plate still in place but didn’t quite get it all off. We’ll probably never know the answer to that one, but whatever the story, that is how the black paint looks around the neck plate and so we can at least get that detail right. The first of the two pics above shows Francis holding the OG and the paint can be seen clearly. The black paint around the neck plate is the most overlooked detail in all of the Francis Rossi replicas I’ve ever seen. It’s a very small, and perhaps not that significant detail, but one that we must include in this build for the sake of authenticity. This pic is quite recent and a lot clearer than others I have, so I’ve used it for the purpose of showing this small area of black paint. However, the back of the guitar in this pic is a lot dirtier than it was in 1985! The one thing I have not done on this build is to recreate the dirt and grime. This will happen naturally over time with handling and playing and will look all the more authentic for it. The second of the two pics (not very clear I’m afraid) also features Francis holding the OG and shows the wear pattern created by his forearm, which we have created faithfully on this build (see above pics). This pic is much closer to the Live Aid period and you can see that the back of the guitar is a lot cleaner too! Here’s a clip of Quo performing Don’t Waste My Time and Paper Plane live at the Marquee in 1972. The now famous Paper Plane promo video actually featured the footage from this clip but was overdubbed (perfectly) with the studio track. 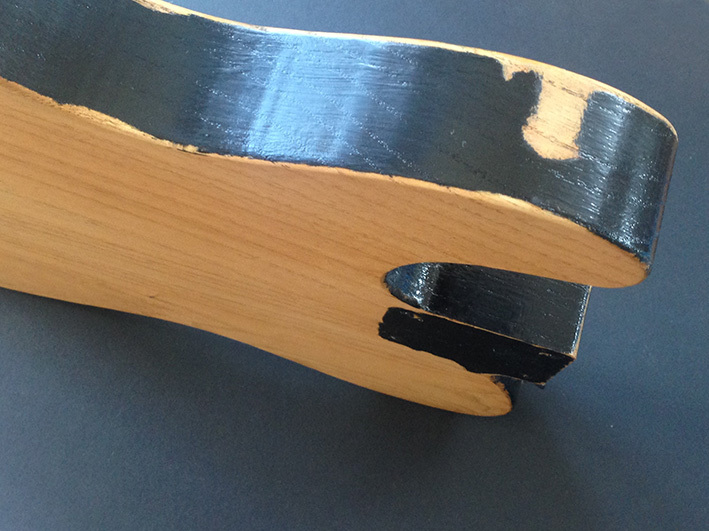 All text content and pictures of the guitar build appearing in the pages and posts of this WordPress blog are the exclusive property of Roots Replicas (except where stated otherwise) and are protected under international copyright treaties. The text and pictures of the build contained within this blog are made available for your personal viewing enjoyment only.